TSNPDCL Recruitment 2018 notification to recruit Junior Linemen has been released by the Northern Power Distribution Company of Telangana Limited (TSNPDCL) on its official website – tsnpdcl.in. TSNPDCL has invited applications from eligible candidates for recruitment to 2553 Lineman posts. Online application process for the recruitment will begin on 22 February 2018 and the last date is 19 March 2018. TSNPDCL will conduct exam on 8 April 2018 and hall tickets for the same will be available from 2 April 2018. Exam fee (Rs. 100 as online application processing fee and Rs. 120 as examination fee) can be deposited from 21 February 2018. Details of the recruitment can be found at tsnpdcl.in. Applications must be submitted at tsnpdcl.cgg.gov.in. TSNPDCL Recruitment 2018 : 2553 Junior Lineman Posts, Apply from 21st Feb 2018: TSNPDCL aims to fill 2553 Junior Lineman vacancies in the Telangana State. The online application process for the same is scheduled to begin on 22nd February 2018 and will conclude on 19th March 2018, 11:59PM. Interested candidates must keep a tab on the official website and apply online once the application process starts. TSNPDCL Junior Lineman Recruitment 2018: TSNPDCL Junior Lineman Recruitment 2018 has begun on the official website of Telangana State Northern Power Distribution Company of Telangana Limited (TSNPDCL), Warangal - tsnpdcl.cgg.gov.in. 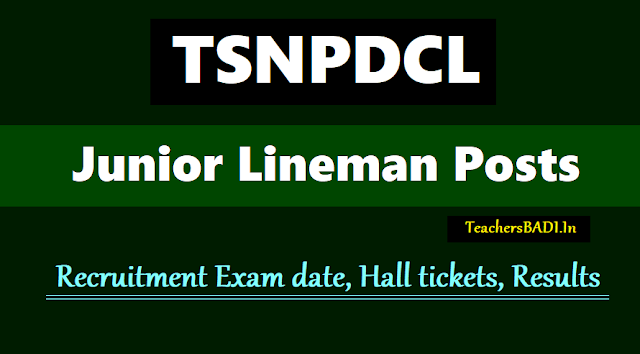 TSNPDCL aims to recruit 2553 candidates for the post of Junior Lineman. Candidates interested in pursuing their career with TSNPDCL can follow the instructions below and apply online on or before 19th March 2018, 5 PM. The selected candidates will be placed in the pay band of ?15,585 – 305 – 16500 – 445 –18725 – 580 – 21625 – 715 –25200. Candidates will be selected on the basis of a Written Examination scheduled to be conducted on 8th April 2018 from 10:30AM to 12:30PM at different exam centers located in the GHMC area of Hyderabad and GWMC area of Warangal. Applicants are required to pay an application fee of ₹100 and examination fee of ₹120 online before submitting their application online. After payment of the application fee and examination fee, candidates need to login to http://tsnpdcl.cgg.gov.in to complete the application process. The applicant must fall in the age bracket of 18-35 years as on 1st January 2018. Age relaxation of upto 5 years in upper age limit applies to SC/ST/BC category candidates. Candidates in the age group of 18-35 years (as on 1 January 2018) with SSLC/SSC/10th Class pass and I.T.I. qualification in Electrical Trade/ Wireman or 2 years Intermediate Vocational course in Electrical Trade are eligible to apply. Relaxation in upper age limit is permissible up to 5 years for SC/ST/BC candidates.